Do you know what Rickshaw means ? The name “Rickshaw” comes from the Japanese expression, "ji riki shaw" which means "vehicle powered by man". 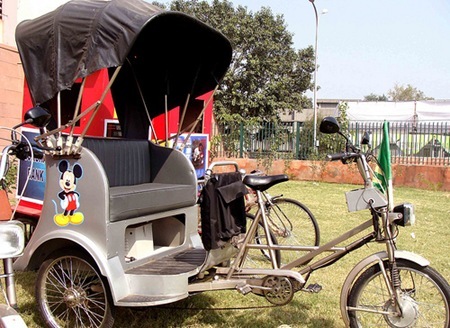 The concept of the rickshaw first came to China, then India and throughout and all of Asia. No more are Rickshaws powered by man (except some parts of North India), but by highly polluting 2 stroke motors ! I am sure most of you have experienced the thick black smoke emanating from “Dugdugis” or “6 seaters” or even normal Auto Rickshaws. The amount of pollution caused by these vehicles has to be seen to be believed. 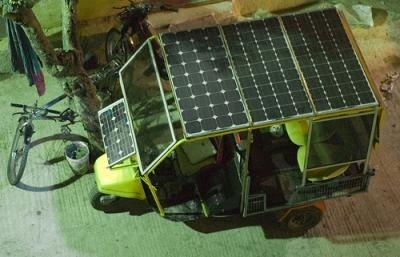 Rickshaws powered by solar energy could be your next mode of transport, courtesy of a Commonwealth initiative. The Commonwealth Business Council (CBC) has set up an incubation hub in partnership with the Indian government to develop cutting edge energy-saving technologies, it announced Tuesday. Even here in India there are couple of initiatives that are currently under experimentation. Soleckshaws, as they are known, have been developed that run on solar-powered batteries, and were introduced early in October 2008 in Delhi by the Assam-based Center for Rural Development (CRD). 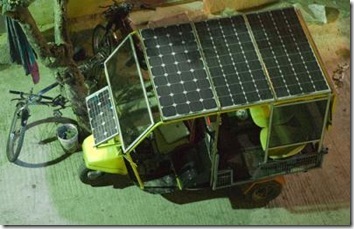 Another prototype of a normal Auto Rickshaw converted to use the Solar power. Now thats really a good news – non polluting, energy efficient Rickshaws would be great for our environment. Its not going to be easy though, Indian already has close to 10 million of these vehicles currently on roads. To commercially develop these vehicles, and get them on roads is a tough long drawn task. However, everything needs to start somewhere. Maybe we start seeing fruits 10-15 years down the line. Offcourse, don’t forget, we are already seeing a lot of research on Water and Air powered cars as well. 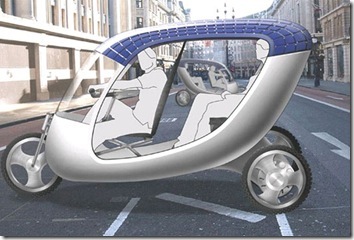 "Yes, We desperately need them – The Solar Powered Rickshaws. ", 5 out of 5 based on 1 ratings. Satyam goes to Tech Mahindra. Is it a win-win for all parties? solar enery used man pulled ricshaw is very great thing, it will help poor common man useful getting dialy bread as stand thier familiies in finacial security. require develop technogyies get available affordable price. govt support you and God support & bless you. I would also like to give more insights to th etopic. There has been an invention of Solar Planes in US. The speed is nearly 200 km/hr. They have started researching on getting the spee dof MACH1. Looking to Boeing to go for such a deal. yeah …. we desperately need ’em!!!!!!!! !